My fictional podcast had been released for weeks, and I could count on my fingers how many local friends had listened to it. This had been a sensitive source of tears, anger, and anxiety attacks, and this was very welcome news. To love an artist well, it is essential to show up and engage their art. But then what do you say? You can tell when someone really likes your house, shoes, or haircut when they offer specifics. Artists have that same sense, so loving them well means offering specific compliments. We need to approach art searching for one good thing, something specific we enjoyed that we can then share with the creator. Song: I got chills when the drums came in. Actor: During that one scene, I wanted to punch you in the face. Article: I teared up during that last paragraph. Improv: That island scene…I couldn’t breathe I was laughing so hard. Painting: It makes me feel like I’m on my family farm. It’s simple but far from lazy. In fact, these gut responses often outshine “critical analysis” because it shows a connection to the work. The first online comment I got about my podcast was about the listener smiling during a particular scene. I loved it. It’s like a handwritten note from a friend next to a birthday card from your insurance provider. The “one good thing” is all about specificity. And then actually telling your friend. There is no reason to withhold a compliment from a creative friend. Late compliments aren’t weird, it shows you’re still thinking about their work days later. This specific compliment needs to be something they did. If you just saw your friend acting, raving about the costumes isn’t going to make their night. In fact, if you only go on and on about everyone else, it will come across like you didn’t care for their contributions. And maybe you don’t care for your friend’s work. Sometimes finding even one good thing is really hard. She may very well be bad at this craft, but as a friend your job isn’t to make her improve or quit. The market will take care of those things. You need to be a friend, especially right after a show when she’s at her most vulnerable. Whether your friend is great or awful, specific compliments help her improve. An artist’s voice is just as important as craft, and “Do more of this” is more helpful than “Do less of that” for honing in on that creative voice. If you only like one song from the coffee shop set, tell her why it was your favorite and hopefully she’ll write more with similar qualities. Identifying one good thing is a skill that takes practice, but it’s much easier to find when you’re actively looking for it. Even if you can’t find it, you can relax knowing there are always the gift of questions. When supporting artists, questions are your best friend. Questions bail you out when you blank on compliments and keep things going after you run out. They allow you to support your friends in between projects and encourage any artist you meet. They free your friend to talk about their work on their terms, and they can help you find your one good thing. “How did that feel?” I teach sketch comedy writing classes, and this is always my first question after a sketch is read aloud in class. The writer was vulnerable and generous to share with us, and this gives them the first word. Their response usually includes a version of either “I’m disappointed” or “I’m pleasantly surprised,” and this helps me frame my praise and feedback. Who runs this venue? What are they about? When did you get started on this work? Why did this subject draw you? All you have to do is be curious and listen. You’ll naturally have some follow-up questions, and something she says will likely remind you of another good thing to share. The W questions don’t just work after shows, the questions above can be asked to any artist, any time. Perhaps the best one is “How can I see your work?” Ask an artist to show you an image on their phone, to send you a link to that article or song, or ask a performer when you can see them on stage. If it’s a lot, like a podcast with 50 episodes, just ask for a good starting spot. There are no dumb questions! If you don’t know anything about marionettes, don’t pretend like you do. 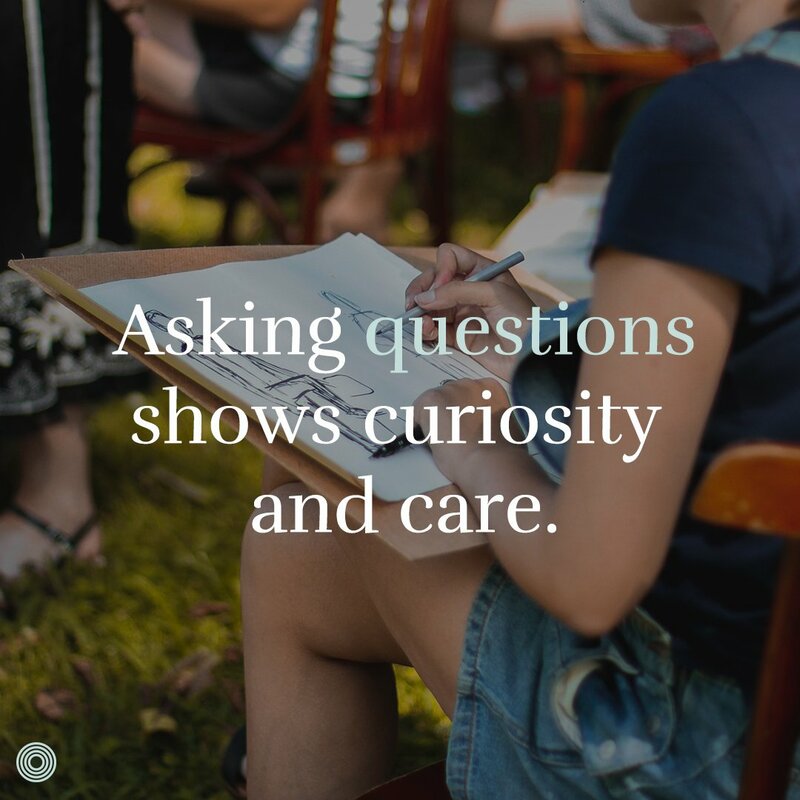 Asking questions shows curiosity and care. It is refreshing for an artist to be treated like an expert. 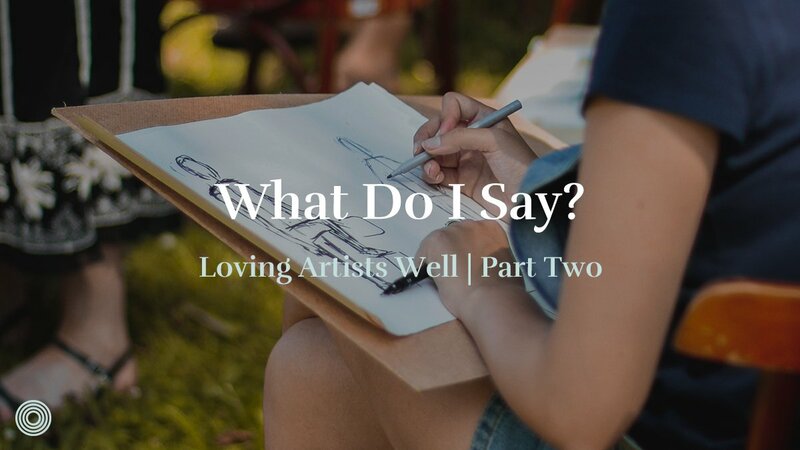 A quick warning: artists are used to one or two questions, especially the typical ones, and may give a canned response that comes off as dismissive or cold. If you find yourself thinking, “Do you even care about this?” it’s likely they’re wondering the same about you. We need to gently push past polite, to show that yes, we really do want to know. Maybe your string of questioning melts some ice, maybe it doesn’t. The goal is care and relationship, not a response that makes us feel good. A single conversation can encourage an artist, but true care is shown by ongoing interest. My most supportive friends come to my shows, know what I’m working on, what’s exciting and hard about it, who I tend to collaborate with, and my creative hopes and dreams. That knowledge isn’t built in a day. It’s easy to amplify your specific compliment by sharing it with others, especially with a little thing called the internet. A tagged social media post honors your friend and it provides a natural way to share their work. It’s a true gift because there’s a legitimacy that comes from others’ words. It can also be difficult for an artist to describe her own work, and your words may give her just the description she needs. Sharing compliments with others is just as impactful in-person. If you go to a friend’s show as a group, sharing your one good thing will encourage others to articulate theirs. Don’t wait until the artist pops into the circle – get people thinking early and give them a chance to verbally process. When introducing your artist friend, rave about why they’re good at what they do. At worst you’ve honored them and maybe they’ll get a new fan. The seventh chapter of Luke is full of Jesus’ power. He heals a centurion’s sick servant, raises a widow’s son from the dead, and forgives a woman’s sins. When John the Baptist doubts in prison, Jesus reminds him of his many miracles. Theses incredible miracles are pure grace that meet needs and exceed hopes, yet in each instance Jesus offers the ministry of words. He commends the faith of the centurion, comforts the grieving widow, declares John’s greatness, and praises the radical hospitality of a sinful woman. He shows honor, and does it in front of a crowd. The creative work of capturing reality and sharing it with others can be emotionally, physically, and spiritually exhausting. Like Jesus, John, and the rest of us, artists need words of assurance. With compliments and curiosity, we can be agents of grace. Tell a friend one good thing you like about their creative work. Tell a stranger one good thing you like about their creative work. Tag an online creator and tell them one good thing you like about their creative work. See how many questions you can ask an artist. Listen to a song or watch a music video. Take turns sharing what you like about it. See a friend’s show and share as a group what you like about it. If there’s an artist in your missional community, give them group time to share about their work. Ask a ton of questions. How might your missional community love artists in a way that shows them a glimpse of Jesus? Why Practice Lent as a Gospel Community? Why Missional Community Pilot Groups?